Although several pathological mechanisms have been proposed, the precise pathophysiology of TC is still not entirely understood. Recently, an association between TC and malignancies has been proposed. We present a case with lung adenocarcinoma whose initial hospital admission was due to TC. A 59 year-old man without any history of cardiovascular disease was admitted to emergency service with the complaint of chest and back pain. 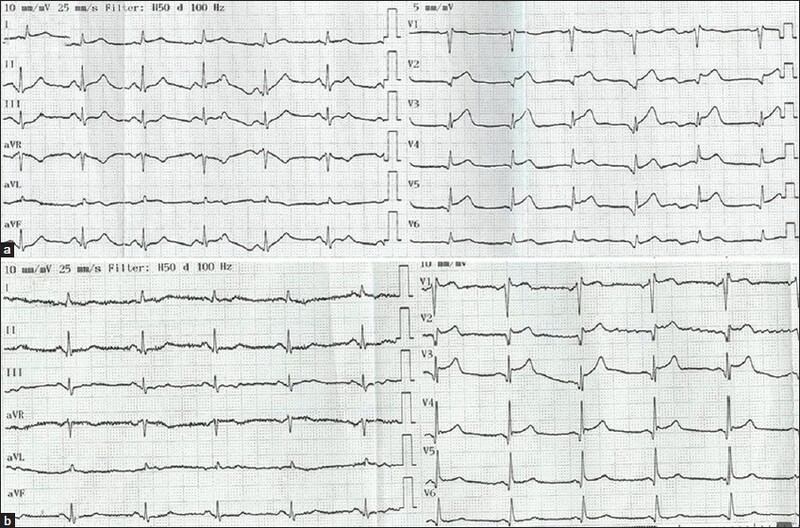 ECG revealed sinus rhythm with a rate of 70/min, 2-3 mm ST elevations in V2 and V6 [Figure 1]. His blood pressure was 110/70 mmHg. He was on antihypertensive medication and smokes 20 cigarettes per day for more than 20 years. He was immediately taken into the cardiac catheterization laboratory with the diagnosis of acute anterior myocardial infarction. 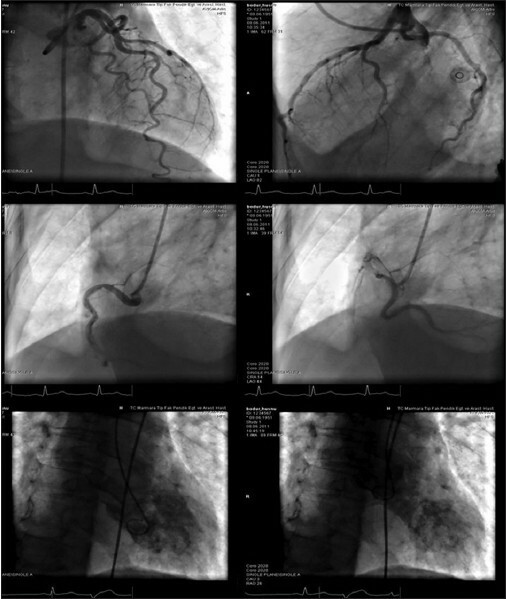 Coronary angiography demonstrated patent coronary arteries without significant stenosis. Ventriculography demonstrated systolic apical ballooning which is typical for TC [Figure 2]. 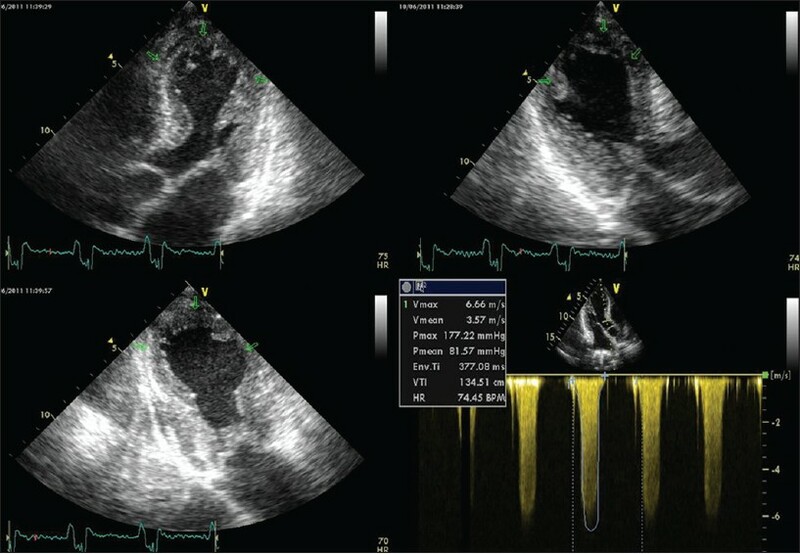 Transthoracic echocardiography demonstrated apical akinesia with a dynamic LV outflow tract obstruction (peak resting gradient: 45 mmHg, peak gradient reaches to 177 mmHg and mean gradient to 81 mmHg with valsalva maneuver) [Figure 3]. ST elevations returned towards baseline and his complaints were improved progressively with medical treatment, which included antiplatelet agents and anticoagulation, beta adrenergic receptor blocker and renin-angiotensin system blocker agents. Troponin T level peaked at 0.71 ng/ml. Patient had a cachectic appearance and had complaints of backache and dysphagia with weight loss of 25 kg during the last 12 months. Endoscopic examination revealed esophageal obstruction due to external compression. Computed tomography scan of the chest revealed a mass with 5 x 2.5 cm diameter at the level of right pulmonary upper lobe on the posterior segment, extending from retrotracheal to paravertebral space with bone invasion. There were also multiple mediastinal lymphadenopathies. Fine needle aspiration biopsy obtained from mass showed neoplastic cells and immunohistochemical analysis demonstrated that these cells were reactive with CK7, CK20, and TTF-1 antibodies. He was diagnosed with lung adenocarcinoma and whole body positron emission tomography (PET) demonstrated hypermetabolic subcarinal and paraosephageal lymphadenopathies and lytic/sclerotic lesions on thoracic vertebral bodies (T 3-4-5) and right sided ribs (from 4 th to 9t h ), which were accepted as metastases. Repeat transthoracic echocardiogram performed 10 days after admission revealed complete resolution of LV systolic dysfunction and disappearance of LV outflow gradient [Figure 4]. TC usually mimics acute coronary syndrome and the most common abnormalities on the ECG are ST elevations on the precordial on the precordial leads. Usually there is only a moderate rise in cardiac enzymes which is disproportionate with the size of the affected myocardium. Dynamic LV outflow tract (LVOT) obstruction may occur in up to a fourth of TC subjects. Basal hypercontractility related venturi effect has been suggested as a cause of dynamic LVOT obstruction. TC is a transient syndrome and resolution of symptoms with complete echocardiographic and clinical recovery is expected within 2 to 3 weeks of presentation. Our patient had complete recovery of cardiac symptoms and echocardiography performed 10 days after presentation revealed complete resolution of both wall motion abnormalities and dynamic LVOT obstruction. To the best of our knowledge, this is the first paper reporting TC in a patient with lung adenocarcinoma. The development of TC may be a result of paraneoplastic phenomena as previously suggested. Our patient had bone metastases causing backache and had complaints of dysphagia with weight loss of 25 kg during the past 12 months, which might also have constituted sufficient physical stress for the development of TC. TC was the initial cause of hospital admission in our case with lung adenocarcinoma. We contribute this case report to the growing set of literature data regarding the presence of various concomitant malignancies in patients with TC. Further research is needed to elucidate the relationship between these diseases. 1. Bybee KA, Prasad A. Stress-related cardiomyopathy syndromes. Circulation 2008;118:397-409. 2. Nef HM, Möllmann H, Akashi YJ, Hamm CW. Mechanisms of stress (Takotsubo) cardiomyopathy. Nat Rev Cardiol 2010;7:187-93. 3. Burgdorf C, Kurowski V, Bonnemeier H, Schunkert H, Radke PW. Long-term prognosis of the transient left ventricular dysfunction syndrome (Tako-Tsubo cardiomyopathy): Focus on malignancies. Eur J Heart Fail 2008;10:1015-9. 4. Guerrero J, Majid A, Ernst A. Cardiogenic shock secondary to Tako-tsubo syndrome after debridement of malignant endobronchial obstruction. Chest 2009;135:217-20. 5. Chockalingam A, Xie GY, Dellsperger KC. Echocardiography in stress cardiomyopathy and acute LVOT obstruction. Int J Cardiovasc Imaging 2010;26:527-35. 6. Kassim TA, Clarke DD, Mai VQ, Clyde PW, Mohammed Shakir KM. Catecholamine-induced cardiomyopathy. Endocr Pract 2008;14:1137-49. 7. Kurowski V, Kaiser A, von Hof K, Killermann DP, Mayer B, Hartmann F, et al. Apical and midventricular transient left ventricular dysfunction syndrome (tako-tsubo cardiomyopathy): Frequency, mechanisms, and prognosis. Chest 2007;132:809-16. 8. Burgdorf C, Kurowski V, Radke PW. Long-term prognosis of transient left ventricular ballooning syndrome and cancer. Heart Lung 2011;40:472.